A few years ago I went to Fengdu and visited the Taoist Hell there. 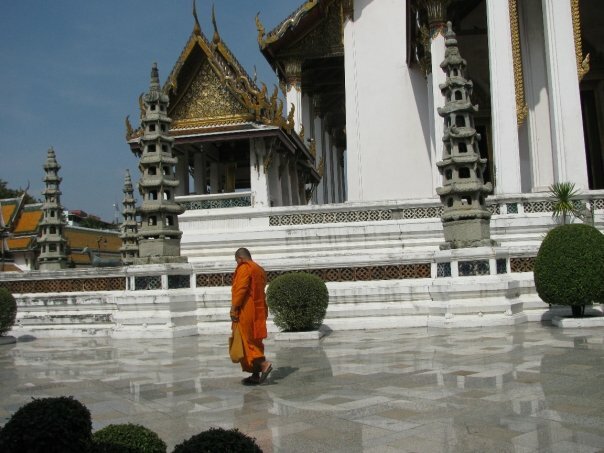 I was hoping that this Buddhist hell would be similar, but it wasn’t. This hell was smaller. But it was easier to find and not as remote. I still had a great time. 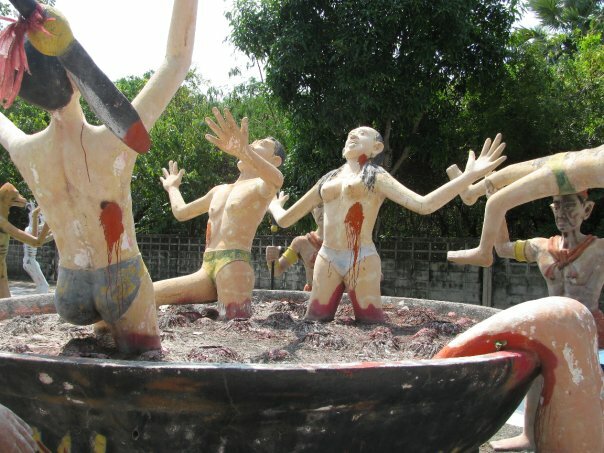 It was very hot in Hell as with anywhere in Thailand. After Hell, we decided to head to the beach in hopes of finding a restaurant with air conditioning. Luckily for us, there was a hotel pretty near the gate of the temple and it did in fact have air conditioning. Ordering food. Take your time boys. After lunch we walked to the beach. I didn’t really want to go swimming at first. The water was pretty brown and not calm at all. Plus, it was very shallow. It just wasn’t a good beach for swimming. But it was a really hot day and brown, choppy, shallow water is better than nothing, so Mark and I jumped in. 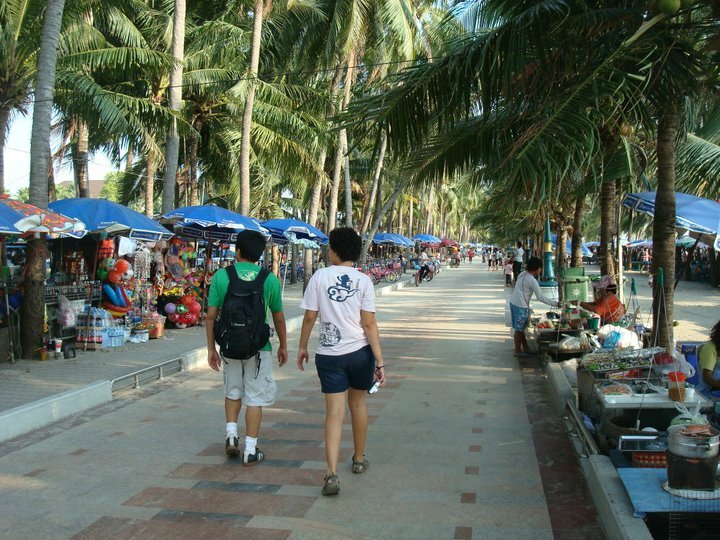 After Mark and I had had enough of swimming in brown water we went for a walk down the market street along the beach. There were so many vendors non-aggressively peddling their wares. 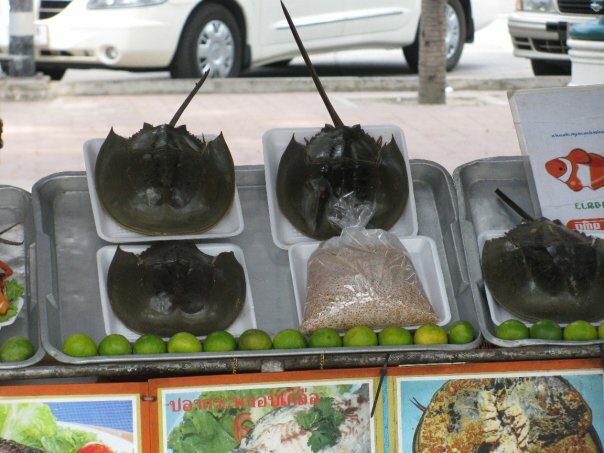 When in Thailand DON’T eat the female horseshoe crabs!!! Mark and John spotted some horseshoe crabs for sale. The vendor would grill them up for whomever would buy them. John and Mark dared each other to try some horseshoe crab. Mark was about to take up the dare when the vendor flipped a crab over. The underside is not very appetizing. Mark past. By the way… If you’re ever in the mood to eat horseshoe crab, remember one thing. 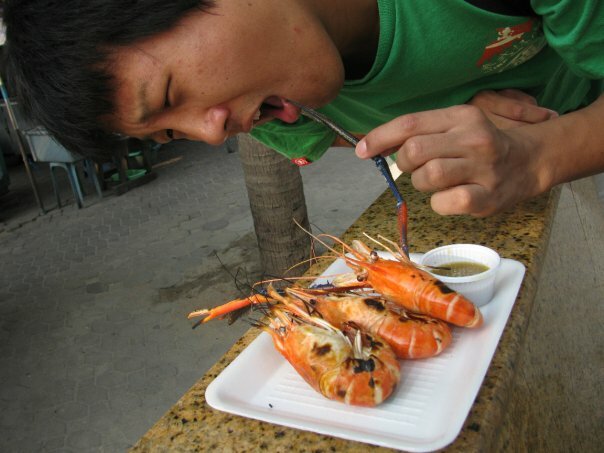 Never eat a female horseshoe crab from Thailand. If she is pregnant and you eat one of the eggs inside her, you could die. Horseshoe crab eggs, from Thailand, are poisonous to humans. We didn’t know how to get back to Bangkok, so we found a very fancy hotel and asked for directions. They gave us a not-to-scale map of the town and told us where to go. We could have taken a songtow to the town’s main road, but we felt like walking to see more of the town. Once near the Chinatown area we found a bus that said “Bangkok” and got on. We were in Bangkok 1.5 hours and several near accidents later. Go to Eastern Bus Terminal,alsoknownasEkamai Bus Terminal. 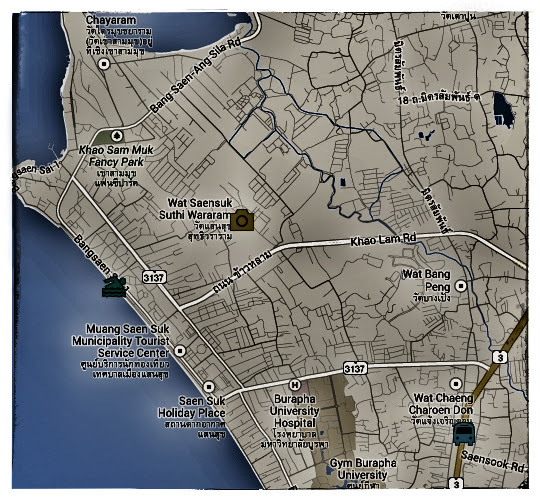 You can find it near the Ekamai BST station (E7). Go out exit 2 and make a u-turn. The bus ride is takes 1:30 hours and costs 77THB. 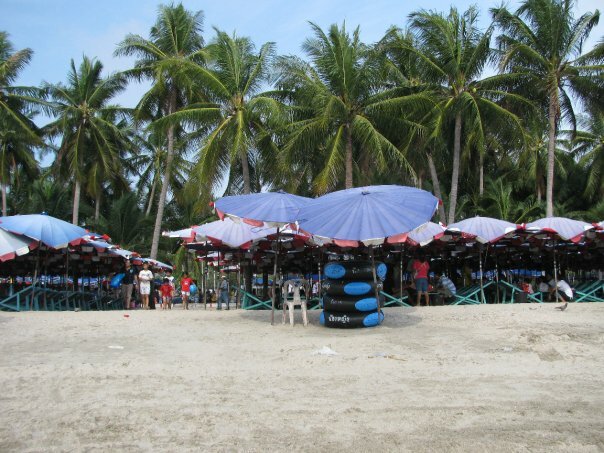 Bang Saen Beach is not the last stop. Make sure to ask the driver or the ticket lady/man to tell you when your stop is. There is no bus terminal in Bang Saen. It’s just a bus stop. To get back to Bangkok you need to go near the Chinatown looking area in this picture. The buses heading to Bangkok stop about a block away from this gate. 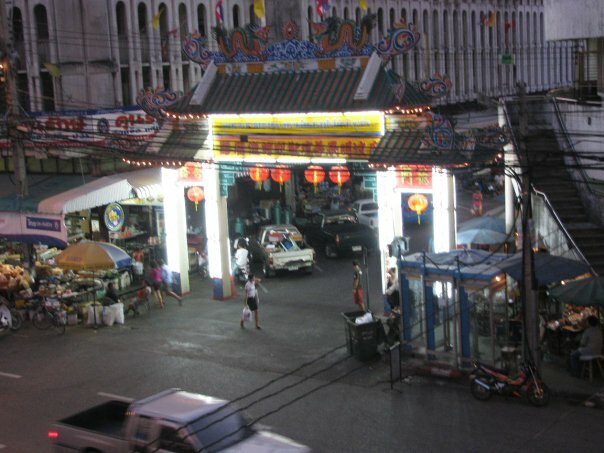 The buses coming from Bangkok stop across the street from this gate. To get back to Bangkok just look out for a bus with “Bangkok” written on the side, then hop on. There are many buses that pass by, so if one looks too full, just get the next one. You might not want to wait for the next one too late in the day though. I think that all buses stop running through this town around 8:00pm. 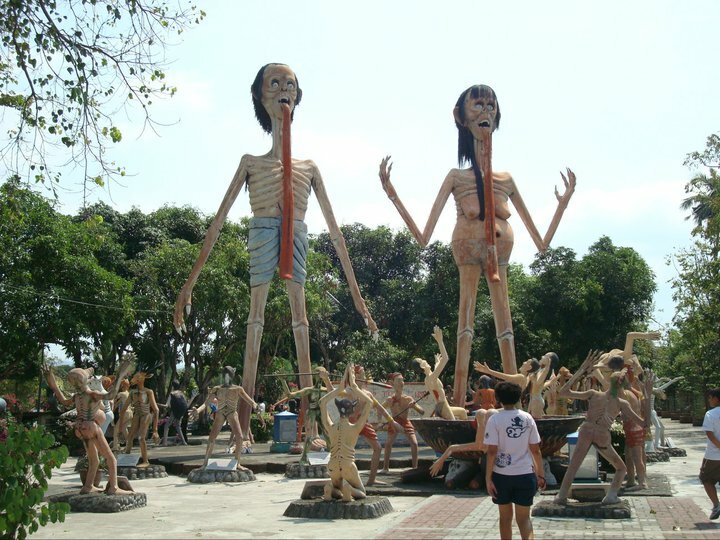 Once off the bus to Bang Saen Beach, get a songtow or motorbike taxi to Wat Saen Suk. 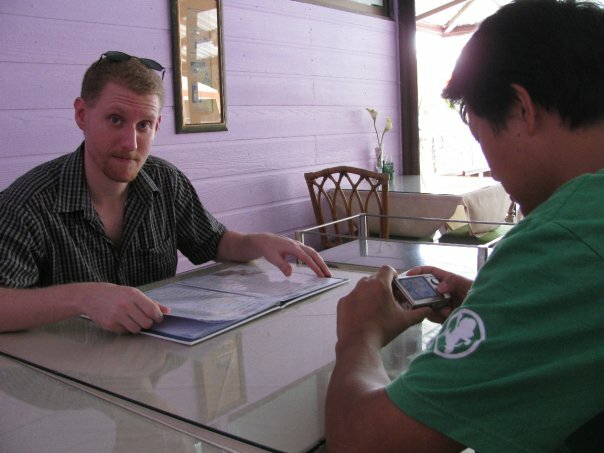 Negotiate a price before getting on the motorbike taxi. Songtows tend to have set prices. Make sure to bring lots water. There is a restaurant near by, but no where to just buy water. From Wat Saen Suk you can walk to the beach. Head out the gate then walk straight to the main road. Cross the street then head left. Continue until you can turn right. Go straight and you will hit the beach. If you need a place to change you can pay 5THB and change at the public bathroom. You can also shower there, but I don’t recommend it. If you do, bring your own soap and towel. But really, unless you’re very dirty, you might want to skip this. The water in the shower is slightly less brown than the water at the beach. 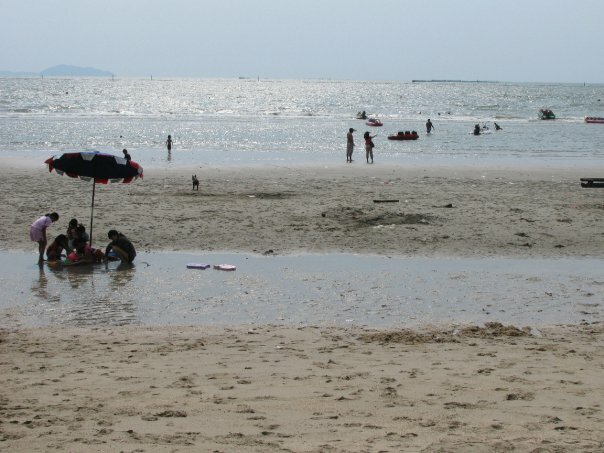 The beach at Bang Saen is far from a great beach. In fact if it weren’t so hot, I would have never even put my little toe into the water. But the heat melted away all my beach snobbery.